Can&apos;t recall the name of the people that took us, but it was the BEST! Can&apos;t recall the name of the people that took us, but it was the BEST! They were very knowledgeable and found a GREAT spot to see MANY whales. We were very thrilled. The whale-watching part was good. Great tour and fabulous price! Great tour and fabulous price! Got half off as the vendor was trying to fill the boat! Part of our excursion was cancelled, but we only found out about it once we were off the ship. We saw several whales and were even lucky enough to see one breach! We saw several whales and were even lucky enough to see one breach! I wish we had been a little closer--it seemed like the other excursion boats went in closer than ours. Went on an NOAA research vessel with a small group. Went on an NOAA research vessel with a small group. Couldn&apos;t have been better. Small group, very personalized, great ship captain and informative naturalist. Small group, very personalized, great ship captain and informative naturalist. A wonderful day and I highly recommend! Humpback Whales, sea lions, seals, otters while enjoying narrative from native Alaskans. Humpback Whales, sea lions, seals, otters while enjoying narrative from native Alaskans. Awesome! We found a small tour operator who gave us a great deal and promised whale sightings or a refund. If you are going whale watching, so much better on these small boats that carry 15 passengers. This one took us to mendenhall glacier first for about an hour then on a boat to go whale watching. 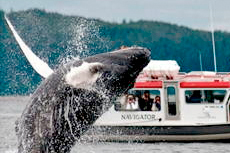 Booked independently with Juneautours.com for whale watching and Mendenhall Glacier. Saw about 5 whales who popped up approx 12 times plus sealions. Saw about 5 whales who popped up approx 12 times plus sealions. The Tour guy had a wicked sense of humour. It was a very wet day but we enjoyed the whole experience. Plus net lovely flow cruisers from America . Used Harv and Marv&apos;s for a private Whale watching charter. Amazing! Great Guide, Shannon and Captain Michael on the Gastineau Guiding tour. We saw several whales many times and learned a lot about them and their habitat. A great tour, totally worth the money and time! Despite the rain and wind, this was really cool. Despite the rain and wind, this was really cool. We saw several whales, and learned a lot about whale behavior. We got off the ship and our bus was waiting. Whale watching was a bit of a letdown as all we saw was a little bit of the whales backs and a tail here and there. Would have preferred more time at the Mendenhall Glacier. Very fun. It was raining and the seas were rough but we still saw whales and had a great time. They served us a bagel with salmon cream cheese, coffee, hot chocolate,and water. The boat was enclosed and warm or you could be outside. The boat tour was very nice. Evening Whale Watching was cold but fun. Evening Whale Watching was cold but fun. Saw a lot of whales and other sights and animals. Professional staff, pretty good buffet. Nice upstairs viewing area. Excellent narrative.